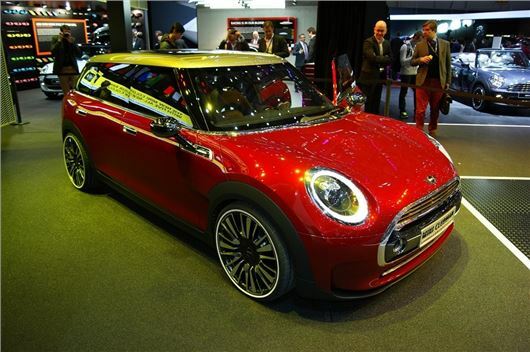 The MINI Clubman Concept has been shown for the first time at the Geneva Motor Show. It might be touted as a concept, but it looks very much ready for production, with styling similar to the upcoming hatchback. You can expect to see the next Clubman in 2015. Unlike the outgoing Clubman, this version has a full four doors, rather than an unusual three-door arrangement - and it's topped off by the split-rear doors, as per the outgong Clubman. While it's being pitched as a concept, the new Clubman does have some flourishes that are unlikely to feature in the finished product such as 19-inch alloys. Similarly, the cabin features bucket style seats and a mixture of materials and colours, with blue, red and black elements. Expect the production car to be more traditional. That said, many of the details appear production ready. The rear light arrangement is different from the traditional MINI layout and split boot spoiler is unique but perfectly feasible given the side hinged rear doors. It’s too early to say what will be under the bonnet, but expect an engine line-up much like that offered in the MINI hatch, with new three- and four-cylinder turbocharged engines. The current Clubman is priced from £14,570, but there is likely to be a price-hike for the new model.